Survival, stranded on a strange planet find energy to sustain yourself until you get away with the guidance of your ship's AI. Ping shows tower directions but alert enemies. Follow the towers to the ship to escape! Made during Global Game Jam 2018. It was great working with other people on this. We had a few great 3d artists making props and the ship. 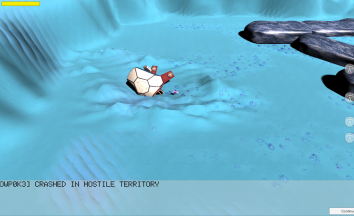 It was certainly enjoyable working on an exploration game with a ai chatting at you when you find stuff. Cookie Dragon Games allows for the contents of Pulse! to be published through video broadcasting services for any commercial or non-commercial purposes. Monetization of videos created containing assets from Pulse! is legally & explicitly allowed by Cookie Dragon Games. This permission can be found in writing at https://www.cookiedragon.games/Games/Index/Pulse.